Officials from the Islamic Hamas group are travelling to Egypt in another attempt to negotiate the easing of the blockade on the Gaza Strip. Hussam Badran, a politburo member of the militant group, said the delegation is arriving in Cairo in a few hours. The talks will focus on reaching a cease-fire deal that Hamas hopes will relax the blockade Israel and Egypt imposed when Hamas seized control of Gaza in 2007. Earlier this week, a Hamas official, Sami Abu Zuhri, said the Egyptian-sponsored efforts to broker a settlement with Israel to lift the closure had been disrupted. Since March, Hamas has led protests along Gaza’s perimeter fence with Israel, accelerating them recently. Thousands attended funerals for seven Palestinians killed by Israeli fire in deadliest day of protests aimed at Gaza’s border blockade in several months. Among those killed near Gaza’s perimeter fence were two boys, ages 11 and 14. A Gaza rights group says the 11-year-old is the youngest to have been killed by Israeli fire in the protests. The top U.N. humanitarian official in the region, Jamie McGoldrick, said Saturday he is “deeply saddened” by the loss of life. He said the sides must ensure children aren’t the target of violence or put at risk of violence. In Friday’s protest, thousands rallied near the fence, with hundreds breaching it in one area. Amateur videos showed protesters kissing the ground on the Israeli side amid sound of repeated gunshots. Hundreds have attended the funeral of an 11-year-old Palestinian boy, apparently the youngest killed by Israeli fire in six months of protests along Gaza’s perimeter fence. 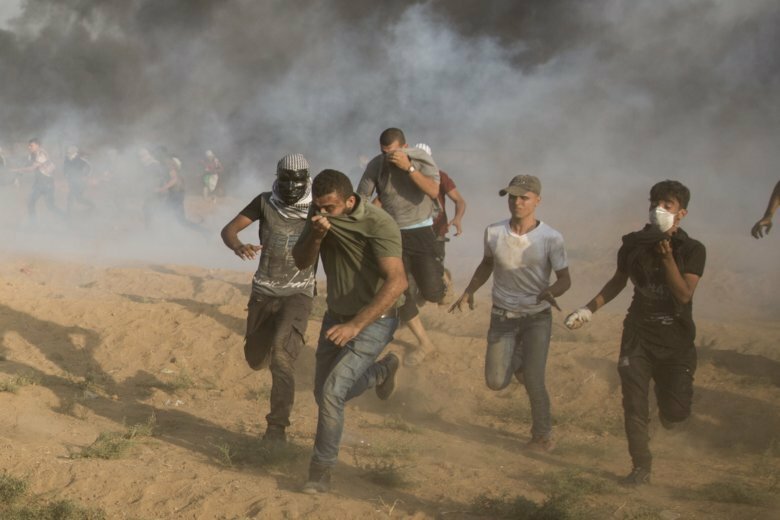 Nasser Musabeh was among seven protesters who Gaza health officials say were killed by Israeli troops near the fence Friday. Protests began in March and recently accelerated after the latest failure to negotiate an easing of Gaza’s 11-year-old border blockade. Israel and Egypt imposed the closure after the Islamic militant Hamas seized Gaza in 2007. Friday marked the deadliest day of protests since mid-May when 60 Palestinians were killed. Gaza health officials initially said Musabeh was 12. However, his family gave his date of birth as Dec. 29, 2006. Another 11-year-old was previously killed in unclear circumstances in the protests by a blunt object. Palestinian health officials say Israeli troops have killed seven Palestinians, two of them children, and wounded dozens more as Gaza’s Hamas rulers stepped up protests along the border fence. Friday marked the deadliest day in recent weeks as thousands of Palestinians gathered at five locations along Gaza Strip’s frontier with Israel in response to calls by Hamas, the militant group that has controlled Gaza since seizing it from the Palestinian Authority in 2007. Hamas has led weekly protests since March, but accelerated them in recent weeks to near daily events, pressing for an end to a crippling Israeli-Egyptian blockade imposed after Hamas’s violent takeover of Gaza in 2007.